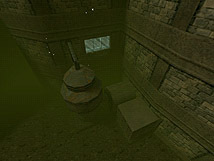 As the rain pours down you find yourself swimming in zombie infested waters. An abandoned police car. Wonder what happened to the cops? An underwater view of the hydroelectric plant. Using the cool new sniper rifle to take out some zombies. Welcome to the land of eternal night, where the average cop on the street, your local neighbor in town, that pretty woman and new mother have all mutated into shuffling, wailing, undead zombies who crave your living flesh. 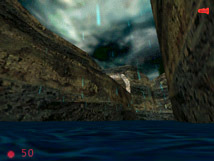 Welcome to 'They Hunger', Neil Manke's latest adventure set in the gameplay world of Half-Life. Neil has transported us far from the technological world that was USS Darkstar (his first release for Half-Life) and has dropped us right into the middle of a grotesque horror film. Think of the zombie film 'Night of The Living Dead' by George A. Romero and you get the idea. Ask any person who attempts to create horror in any medium and you will usually get the same answer, "It's very, very difficult to do." Why? Because you walk a very fine line between frightening and campy, between truly scary and just plain silly. Thankfully Neil has pulled it off and has created an absolutely chilling and frightening 16 level set. 1) Compelling Story Line - As short as it is you are presented with a mystery, something very bad and very recent has happened to this town. Through Neil's written introduction, game intro/exit, and ever present radio bulletins, you set out to solve this mystery. 2) Compelling Visuals - Neil's excellent settings featuring the mausoleum and crypts, the choice of making this a dark 'at night episode', and the creepy models and monster skins all blend to create a very real horrific world. 3) Sound - If this was the oscars 'They Hunger' would certainly be up for an award in the best sound category. The voice acting is spot on here, from the haunting 'Why do we hunger?' to 'Where are you?,' it's enough to make your skin crawl. The excellent sound is at least half of the experience, the visuals being the other. Also memorable is that weird tune that is heard from time to time. No, you won't be able to rush out and buy it at your local CD store, that was edited together by Manke from various snippets of middle eastern music found on the net to create one unique song. 4) Gameplay - The above would mean nothing if there was not also an exciting gameplay experience to be found here. 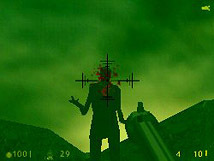 The close and personal style of combat with the disturbing zombies, particularly in the early levels are very intense and may genuinely frighten less mature gamers. There is nothing like being armed with only a crowbar and then to be surrounded by these shuffling mutants! 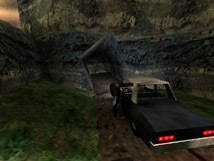 5) Special Effects - The rain, the scripted sequences, the outstanding sniper rifle (worth the download time itself), the cinematic underwater visuals, collapsing walkways, police car and train interactivity, all combine to elevate this level above the ordinary, far above. They Hunger is yet another notch on Neil Manke's creative belt. It also marks the darker side of Manke, a macabre underbelly that was hinted at in previous levels...but has now been fully unleashed. Beware! Immersive horrific gameplay, sound and voice acting, satisfying length and that very cool sniper rifle! Mature themes, genuinely scary, may frighten little children. You have been warned. Neil Manke meets "Night of the Living Dead" film producer George A. Romero. A frightening zombie filled gameplay experience. Hunger Cover Art Created At Quake Map Hotel! Coming soon to a jail cell near you!